The Euro closed a bit weak yesterday at 1.1430 after a slow session with lack of economic data. Furthermore, investors are still digesting Friday’s NFP mixed report. The question currently in investors' minds is: Will the FED continue raising rates after the latest strong NFP data, or will they back off and possibly even cut rates? This uncertainty could keep the Euro trading in the same range until further clarity from the FED. In economic news, yesterday the US Factory Orders came in at -0.6% missing the 0.3% forecast. Today, we have a full day of data releases starting with the Euro-zone Services PMI and Retail Sales in the morning. Later in the day, the US Services PMI and ISM Non-manufacturing PMI will be released. 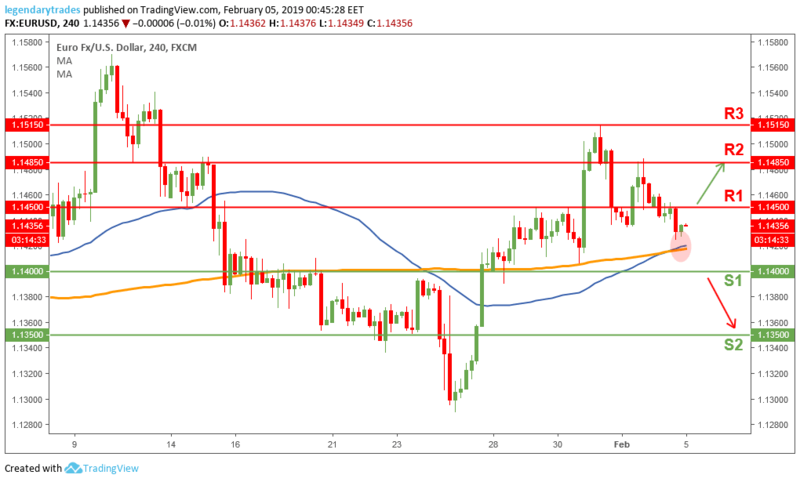 The Euro closed below the 1.1450 (S1) support level, but the bears face a hurdle with the confluence of the support levels up ahead. 1.14-1.1420 (S1, 50 and 200 day-moving averages) is a key support for the bulls, if they lose it we could possibly see more weakness in price towards 1.1350 (S2). On the other hand, if price breaks above 1.1450 (R1) it could pave the way to retest the 1.1485 (R2) resistance.